OK, until very recently, the name Finkenbach only had meaning to me as a rather silly-sounding word that was emblazoned on the cover of a colorful gatefold-sleeved 2LP live album (recorded in 1998) featuring two separate permutations (with and without old friends and relatives) of the band Guru Guru. But that was quite some time ago, long before I ever expected to see the town of Finkenbach for myself, or for that matter the band Guru Guru (now thricely achieved). 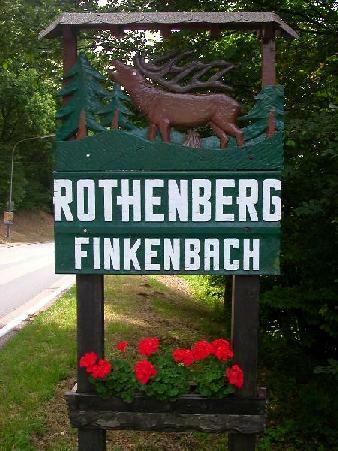 But now, not only do I have these experiences under my belt, I can also explain to you that Finkenbach means literally "Finch Creek." And unlike some other festivals I've been to in recent days, this festival is *really* held in the town of Finkenbach. In fact, one is easily able to sit upon the grassy banks of said creek, remove one's shoes, and dip one's tired feet in the trickling cool waters, all the while being in close proximity to the main festival stage and in direct view of the performing artists. During my transport into the heart of the peaceful Odenwald, I happened upon the small town upon the river Neckar called Hirschhorn (der Hirsch = a large European deer). It was then obvious to me that festival organizer and Guru Guru's main guru, Mani Neumeier, had lived in this region for a long time (the song from 1974's 'Dance of the Flames' entitled "The Girl from Hirschhorn" being a clear giveaway). So then I wasn't actually so surprised when I learned that the Finkenbach festival has a very long history, all the way back to the first one in 1979. And now, apart from a gap of several years in the mid-1980s (a terrible time for 'progressive' music everywhere in the world I guess), Mani and friends have managed to keep this wonderful event going year after year. Having come from the massive Burg Herzberg the previously weekend, I knew this fest would be more 'intimate,' but still I was impressed with the number of attendees, which must have been somewhere in the area of 5,000 or more. The grounds were spread out along the west side of the creek for quite some distance, with large camping areas both south and north of the central area of activity. The lush thick grasses were really a welcome sight, having just dealt with that dry, dusty landscape at Burg Herzberg. Though here I had elected to book a room at a local B&B, so I was going to have a soft bedtime landing no matter what. Along one side of the fest's "midway" was the stage and crowd area, on the other a string of booths and food vendors, including one large cafeteria tent with picnic tables. A wide variety of cuisine was available I was happy to see, and the beer again sported a local flavor, it being supplied by the Erbacher Brauerei. Friday's action got under way right on schedule at 7 PM with one-man act Götz Widmann, a singer-songwriter artist who pens relatively simple songs on acoustic guitar as a medium for sharp-tongued humor about politics and such. But because my limited understanding of German made it difficult to grasp his targets, it was necessary to have my fellow AI-colleague Frank Gingeleit interpret for me. Widmann performed for about an hour, while gradually more and more folks finished their weekend preparations, fed themselves, and got their blankets and such laid out for the evening's early entertainment. Upon completing his set, Widmann got a warm response and I thought it was a good way to start off the festivities, though I was lost on the subtlety of his lyrical art. As dusk was approaching, the Rodgau Monotones squeezed themselves onto the stage (which had seemed plenty large enough for any performing act, but there were a *lot* of Monotones). OK, this name was meaningless to me, but Frank explained to me that they were a quite popular act in the days of the Neue Deutsche Welle (the German equivalent to New Wave music, in fact a literal translation). Which means to me, crap 80s music. But then, maybe crap 80s music was different in Germany, 'cause this wasn't watery synth-pop like the Thompson Twins. 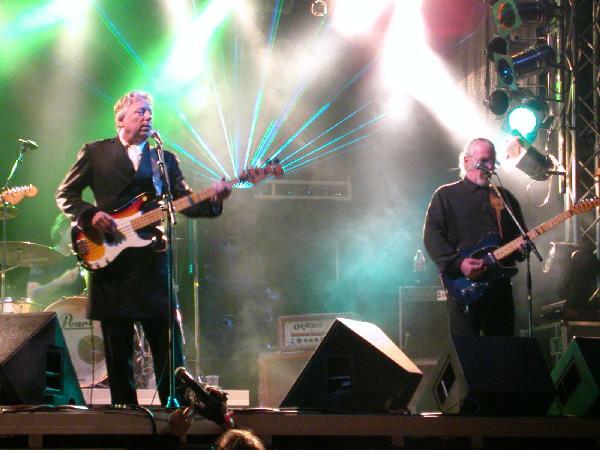 Rather the Monotones were Frankfurt's (Rodgau is an area just to the southeast) answer to Meat Loaf. This sense was supported each and every time the male and female lead singers turned and gestured toward each other while they traded lines. This being their 25th anniversary year of existence, there was no doubt that the Monotones were a well-seasoned and professional live act. But they used up their moderately-interesting songs in the first half-hour and then proceeded to play another full 90 minutes. Unfortunately, as their fans in the crowd got drunker, their music got stupider, and I eventually got impatient-er. I guess it was a bit of an experiment to bring in a pop-rock group to Finkenbach to potentially take advantage of a different sort of festival-goer. Not sure if it worked financially, but Frank and I seemed to agree (apart from our personal taste issues) that it just didn't seem appropriate aesthetically to mix-in something like this. Well, ok, the Guru Guru clan arrived shortly thereafter to restore order, and indeed their set was very strong. This performance was the third that I have now witnessed, with the first featuring Hans Reffert on guitar and the second with Luigi Archetti. At Finkenbach, we were lucky to have both. My opinion is that Archetti is the more 'out-there' psychedelic stylist, and hence is a better fit to the group. But Reffert lives in the area (Archetti being a native of far-away Zürich) and probably needed very little cajoling to come out for the evening with his wooden lap-steel guitar and slide. Anyway, the set was loaded mostly with tracks written in the last decade that now are becoming very familiar to me, but they were performed crisply and energetically, and the audience was enjoying themselves greatly. That said, I do remember that there were a couple 'new' tracks that had been added to the set since I'd last seen them, but I didn't remember to write them down and have since forgotten. I guess though, that these were put in at the expense of the excellent "Space Baby," which I was hoping to hear again...oh well, you can't please everybody. The multi-talented Roland Schaeffer was particularly outstanding on this night, many times blazing away happily upon his double-reeded nadaswaram, an instrument that looks to be temperamental at best. Plus, his dreamy "Marabut" tune is fast becoming one of my favorite moments of each and every Guru Guru show. The Guru's set ended up with Mani's signature "Der Elektrolurch" jam, he appearing again with the signature Elektrolurch mask that I guess (like the song itself) dates back to the very early days of the band. As before, this version is not so much a song anymore, but more a free-form psychedelic jam. But this time it was more interesting since they went on a lot longer, and Archetti went off on some crazy tangents with effects and such. Mani, as usual, was likewise proving his creativity behind the drums, and often his prowess in the form of all sorts of vocalizations and animal noises. All in all, the strong set by Guru Guru made me forget all about waiting through the Monotones. The lightshow too was really quite impressive as well, with a great mix of ever-changing floodlighting that often shined through thick fog, and from the back a programmed laser device that cut through these artificial nebulae with flashing green needles. Late-night entertainment was provided by the equally-ancient psych-blues band Man, hailing as always from Wales. Just like at Burg Herzberg the week before, but this time "late night" started around 1 AM and not 4 AM! That was very helpful in maintaining a semi-normal sleep schedule. They opened again with the lengthy blues number "The Ride and the View," which I seem to remember wasn't quite as smooth this time, because of technical difficulties and because Deke Leonard broke a string midway through. Then I'm not sure his monitor was working so well for awhile, 'cause he once or twice got "separated" from the rest of the group. But old veteran that he is, he soldiered on and the set got steadily stronger as the cool night wore on. Again, having seen them in recent days, I was hopeful for some fresh tidbits. And that came in the form of an amazing half-hour (it seemed) jam of "C'mon," with the veteran crew giving youngster George Jones (son of founding member Micky, so always one of the "family") a lengthy opportunity to show what he could do with his guitar. I was quite impressed... he stepped up and delivered quite a barrage of interesting licks and passages. 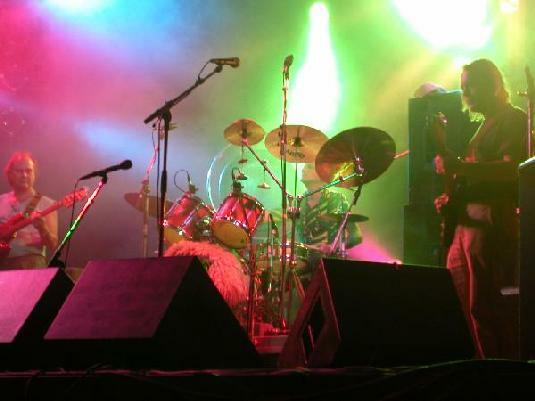 Later, they brought out another great oldie, the track "7171 551" that only appeared on a couple live albums (including the "1999 Party" disc from Chicago when they famously supported Hawkwind in the states). Ah, this was the track I couldn't put a title to that they played also in Basel last November (2002), now that I think back. Well, can you blame me? What on earth could that title mean? It's not Jessie's phone number or anything. Anyway, the Man band was a great wrap-up to an interesting and (uh, let's say) "varied" evening, that would only get weirder as the weekend went on. So... on to Saturday, where the afternoon hours were whiled away by lazy strolls up and down the valley, a bit of browsing in the festival areas, and a wonderful nap to get all one's batteries recharged. The stage that had sat quiet so far all day, eventually came to life at 6 PM, with the Roots Natty Congo reggae band appearing. Personally, while I only listen to it occasionally in my home, I find reggae to be the perfect musical accompaniment to any party atmosphere, especially one in the daytime hours. So this was a welcome sight... though I admit it was a bit of a weird sight at first, when I saw that the band was made up only of white German guys. But that was only during the first few songs, with drummer Alberto Rodriguez (despite the non-German name, a Mannheim native) contributing the vocals. Later, Jamaican-born Ras Abraham (who appeared on "The Harder They Come" soundtrack in 1972) and Surinam native Stanley Landveld joined the core group on vocals and keyboards, adding a more authentic look, if not sound, to the group. IMHO reggae is a hard formula to foul up, as long as the bassist is solid and central to the 'groove.' In this sense, the Congo combo was successful and I had no complaints hanging out on the lush lawn with open ears. Despite the French-sounding name, Mouvement Rapide actually hail from Munich although their lead rapper/singer is originally from the US. Yeah, you heard right, here we had a band that threw in a healthy dose of urban hip-hop/rap stylings into what was otherwise quite an impressive brand of hyper-jazz-fusion. Bassist Andi Bauer was particularly outstanding, and their intro piece (before anyone opened their mouth) was really brilliant. Sustaining a steady groove, whilst on the surface showing off such intricate and 'busy' playing, is a hard thing to accomplish. Bandleader/saxophonist, and budding rapper himself, Stephan Birk has his own idea about modern music that differs from my own though. I think he must have been an ADD-child before they diagnosed such things. And so his hyperactive 'jump-ups' and um.... 'scream-rapping' (scrapping?) weren't entirely welcome to my ears. And the added rapperizing and 'inspirational' or 'political' poetry that was offered by the American guest didn't come off to me as particularly insightful or artistic. At times, I was able to compartmentalize my brain and really focus in on the excellent underbelly though, so I can't say I didn't enjoy Mouvement Rapide to some extent. The six musicians of India's Musafir came onstage one by one, seating themselves side-by-side across the rear portion of the stage, comfortably cross-legged in a way that I could never do (as I was simultaneously demonstrating out on the lawn). In front of them were an array of traditional instruments, those you hit, those you pluck, those you crank, those you blow into, etc. Don't ask me the proper names... nothing electronic certainly, but for the amplification. Their demeanor was friendly and gracious, and their desire to entertain appeared genuine. I freely admit that 'non-Western' styles of traditional music are not my specialty, but I was willing to accept at first that I was in the presence of sounds that should be treated with some seriousness. I played this game for the better part of 30 minutes, but thereafter it was the parade of visual performers filling the front half of the stage that led me to conclude that this band of 'gypsies' was hardly Carnegie Hall material. Why else the goofy side-show? I mean, really, a fat guy with a giant wagonwheel (or whatever it was) balanced on his head and walking on broken glass? And then the ole bed o'nails trick? OK, 'gypsies' is a term that doesn't deserve the negative connotation that goes along with it (esp. as applied to at least one ethnicity of people in Hungary). But I don't know any other way of characterizing what Musafir was really like. And to me, it went from dignified to silly in such a hurry that I couldn't watch anymore and I went out for a walk to see what else was going on around the site. Saturday night's main act featured the legendary Can vocalist Damo Suzuki fronting a quartet including Guru's Mani Neumeier and Luigi Archetti (as their alter-ego Tiere der Nacht) and accomplished contemporary jazz saxophonist Gerd Dudek from Berlin. This largely experimental set was highlighted by some amazing and transcending moments, where out of the chaos would suddenly come a nexus of sound and voice, and at these moments all in the audience were soon swept within. Of course, these moments were when they hit upon a particularly successful trance-like rhythm, and Suzuki, being not just a veteran but a real originator of mirroring this in voice, added his coloration (virtually unintelligable, as always) in fine form. This was my first time seeing him on stage, but he looked and performed exactly how I expected... leaning forward and nearly relying for support from the microphone stand, as if he were himself transfixed. And the eerie green glow of the lights for much of the performance seemed appropriate. Of course, this level of seemingly ad-lib experimentalism (Mani constantly shifting his eyes all around to see where the others were going being a hint to just how much, or little, was preconceived), there were also a few pieces that were rather flat and directionless. Comes with the territory. So, on one hand, it was an unusual performance to have as headliner, but then, quite daring and very much appreciated by myself and most of the audience too, I am happy to report. 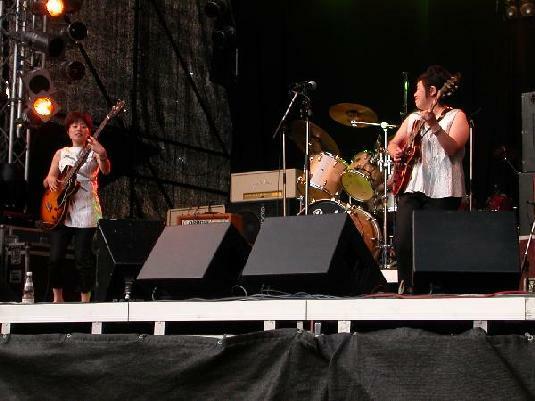 Local Mannheim-product Groove Guerrilla came on as the fest's final on-stage entertainment Saturday night. So, to round off this weekend of fantastic variety, it only made sense to bring forth a R&B/soul outfit! Lead singer Nicole Hadfield looked like Halle Berry and sang like Stephanie Mills (of "Never Knew Love like this Before" and 'The Wiz' musical fame). Which in my book comes across as 'crooning,' and that's never a good thing. That said, the band seemed tight and polished. Though to me this music appears to lack real creativity, no matter how much 'spirit' or passion the artists display. So, it wasn't too long into their set that I decided to retire to my quarters and call it a night. Sunday's entertainment was almost an afterthought in the end. Two different all-percussion combos set their gear up on the grassy area in front of the stage, and each peformed about a half-hour of material in succession. The first, Trommelpalast I believe they were called, was the more skilled group, consisting of four or five players that played more sophisticated compositions that reminded me of the Ohio group Drumplay that always performed at Strange Days festivals. The second group was a larger contingent of folks directed by a lead percussionist with a whistle, rather like a marching band. In fact, this unit was much like the Güggenmusik bands that are so popular here in Switzerland during Carnival time. The thing being that it's really more about just taking part in a community activity more than anything else. Well ok, the lead guy was a talented percussionist, but really all it took to be a part of this large assemblage (the name of which I never learned) was a bit of practice. Nothing wrong with that I guess. But anyway, it seemed that maybe it might have made more sense for these groups to have performed during stage changeovers on Friday and Saturday. Or else put a band or two up on to the stage to make staying around worthwhile. As it was, it didn't make much difference to me, as my journey home was already set for mid-afternoon. Finkenbach '03 wasn't the very greatest music festival I've ever been to, but I really enjoyed those bands I went specifically to hear, and the setting was wonderful. I can appreciate the value of having a wide variety of musical styles presented, but here it maybe got just a bit out-of-hand with a few peculiar choices. Perhaps too, there were a few festivalgoers who were there more for the beer than the music, but I can't say I saw any problems with people in the audience. Anyway, it was definitely an enjoyable weekend, with great weather, pleasant surroundings, and many a melodious note to be heard. Let's hope the Finkenbach tradition continues for years to come. Mani's got a good thing going.